SQL Statements for Excel (Excel Tool SQL Query) is a add-in for Excel that allows to query Excel or Access files from Excel using SQL statements. 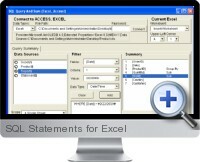 The SQL Statements for Excel interface provides the ability to select and arrange table and field elements instead of manually writing SQL transact code. The add-in can query both Access databases and external Excel files to execute the SQL statements and insert a new worksheet with the returned data very quickly. Easy to create SQL statements without knowledge of SQL transact code. Powerful data querying functionality for decision making. Useful for learning SQL statement syntax. Query both Access and Excel content using SQL. Filter the queried data in Excel. Option to sum the data by fields. Merge multiple Excel files in the same directory folder. Split Excel workbook data by fields.